Use owl to scare yard and garden pests such as rodents, squirrels and birds. 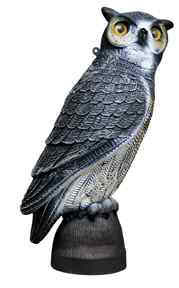 Owl can also be used in boat dock setting to intimidate seagulls. Owl hangs easily from a tree or mounts on a post. Carton Dimensions: 18" x 18" x 23"